Home » This GE Refrigerator Makes the Coffee/Cocoa/Tea of Your Dreams! This GE Refrigerator Makes the Coffee/Cocoa/Tea of Your Dreams! 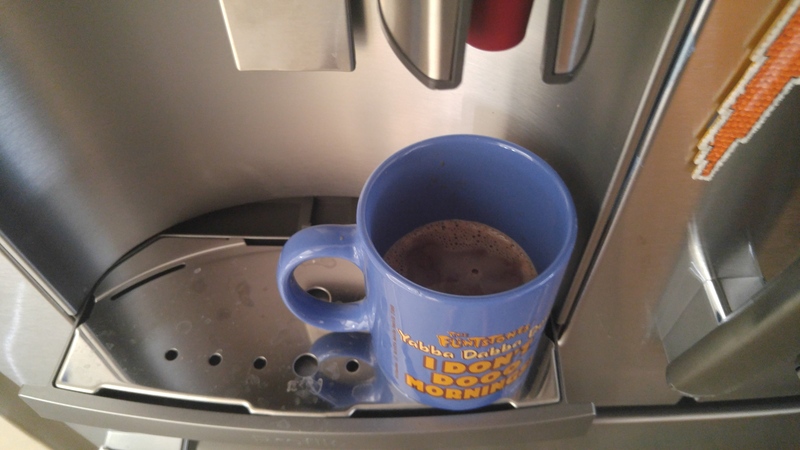 I never thought I would see the day that a refrigerator could brew a cup of coffee, or make a cup of hot cocoa. 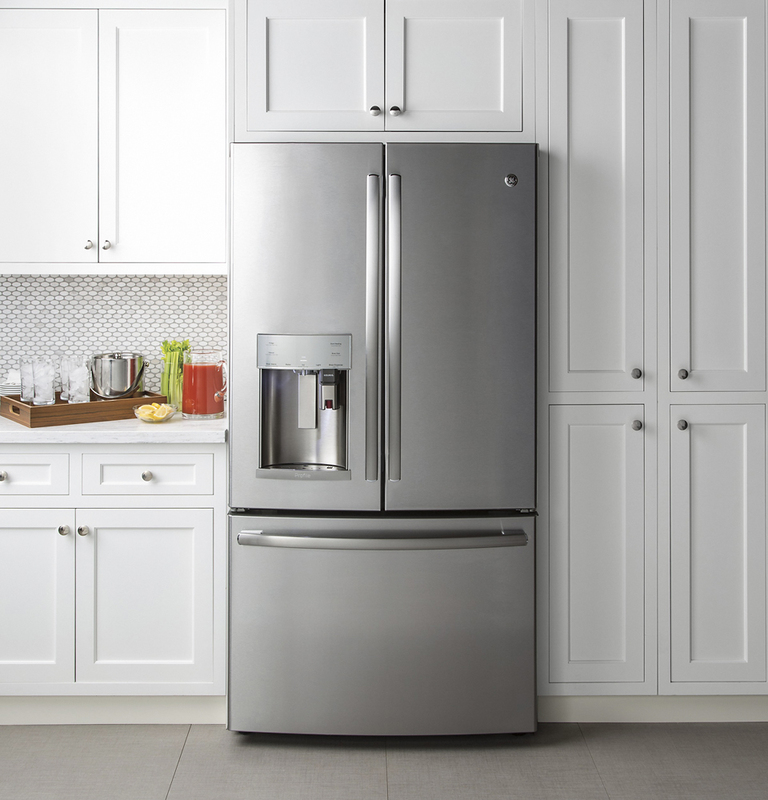 Our new GE Refrigerator does exactly that and more. Technology has truly come a long way. It was in the 1970’s that water and ice became a function of the refrigerator that has only become more advanced even today. Now you can brew coffee or cocoa, or even heat water for tea? I am truly amazed on how smart our appliances have become, let’s hope they don’t try and take over the world! Let’s try and remember this is a refrigerator first. Yes, it has some pretty cool features when it comes to new technology, but I want to explore the different features this kitchen appliance has, and the benefits it can bring you and your family. This is our first counter-depth refrigerator, and I have to say it really does help make it blend in seamlessly with the counter. Our last fridge must have stuck out an additional 3-4 inches, and while it never caused any space or accessibility issues, this one fits more in a natural way like it was intended to. Do you have a household that has a constant traffic of people going in and out of the refrigerator, or the freezer? Do you wish there was a way to ensure that it stayed the proper temperature throughout the day. This appliance can take care of that with it’s TurboCool and TurboFreeze functions that will cool and freeze it to a lower temperature within 8 hours, and reset when done. We have never owned a french door refrigerator prior to this one, and while it is different, it does offer some unique and innovative features like two humidity-controlled drawers that allow you to adjust the settings on them to extend the life of fresh fruit and vegetables. With a choice of 32, 34, or 36 degrees the Temp Select Zone is a great drawer that can meet different purposes depending on your storage needs. Select the temperature you need! I have a thing about great tasting and safe drinking water, and the filter help reduces trace pharmaceuticals, cysts, lead, mercury, asbestos and other contaminants to provide you and your family with options better than tap water. Having a good water filter is essential these days! At 22.2 Cu. Ft. this refrigerator has a fair amount of good space for all the items that you would need for you and your family. With the different layouts for the shelves, the fact that they are spill proof and easy to clean, maintenance on this appliance will not be a chore. This shelf can drop down, or be pushed up to allow taller items like milk in the shelf below. With the drop down shelf in the up position,, we can now fit milk in the shelf below. 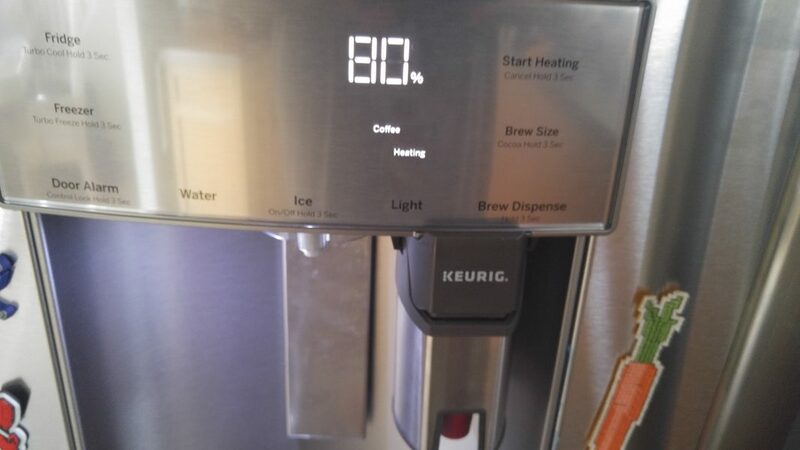 My favorite feature of the of this GE Refrigerator has to be the Keurig K-Cup brewing system that can make your favorite K-Cups in a press of a few buttons. It comes with an adapter that you can place the K-Cup into, select the size of the container whether it be 6 oz, 8 oz, or 10 oz, and have it brew a hot cup of coffee, tea, or cocoa in minutes. You can even schedule it to have hot water at times that you need it, like when you wake up in the morning, how cool is that? Check out some of the pictures below of me making some Hot Cocoa from a K-Cup! I love my Hot Cocoa, always seems to relax me when I need it the most. The nice thing is that we can make coffee, cocoa, or tea for anyone coming over like family and friends. We plan to have an assortment of K-Cups for people to enjoy. Here you can see it is at 80% Took about 2 1/2 minutes to get to 100% Not bad! Hot Cocoa from my refrigerator? Believe it! With the GE Appliances App you can sync this refrigerator via your smartphone and change settings like the temperature of the refrigerator, or the freezer. 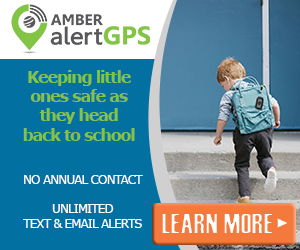 You can also have it notify you if the temperature drops, like if one of your little ones left the door open, you were upstairs you would get a notification that the temperature changed, you can go check and see what is wrong. 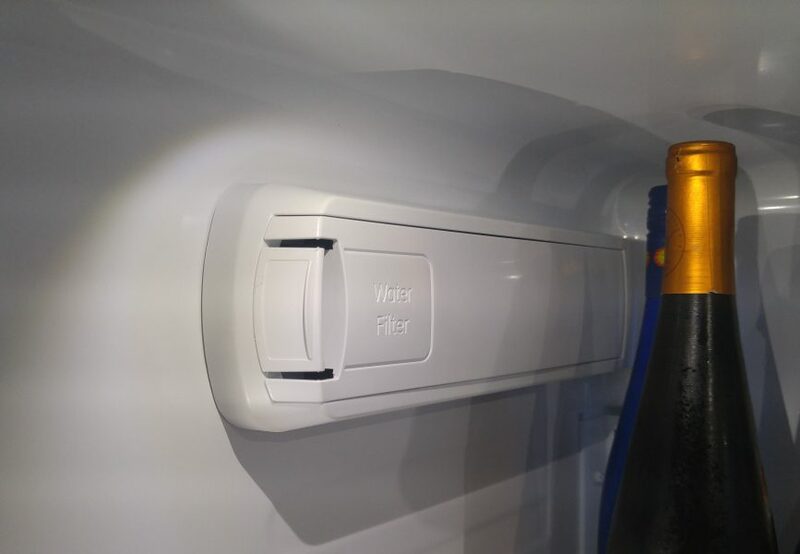 You can also turn the ice maker off and on, and have it tell you if it is full or not, this is great if you go on vacation. 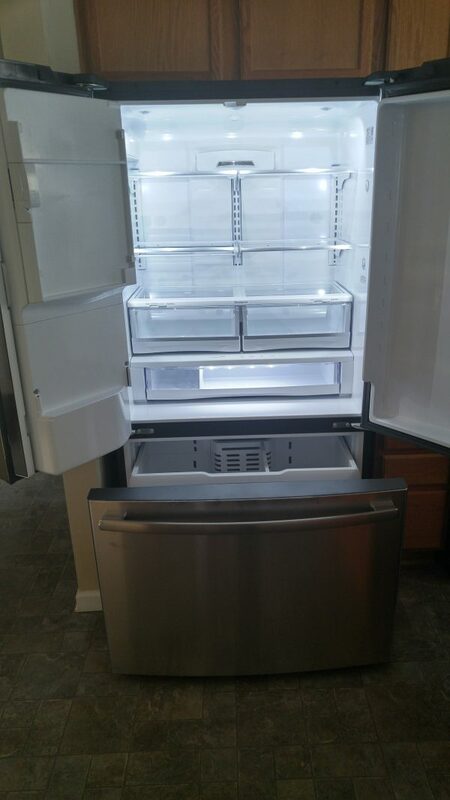 We love our new refrigerator from GE, and I want to thank GE and Best Buy for the opportunity to review this amazing appliance. If you would like more information on this and how to get your own, check out some information here. We have had a slightly lesser model of this same line (without the heated water option) for 4 months and love it. Beautiful look, great function and easily accessible. It is a great product line, and if you keep an eye on them, they regularly have sales and rebates, we got them at Home Depot using GetGo cards when they had a money back program. This refrigerator is awesome, thanks for sharing! We still have the builders-grade fridge in our house, it’s definitely time for an upgrade! We may have to hit Best Buy this weekend! This fridge sounds amazing! Great review Tom, thank you. I’m putting this one on my wish list.